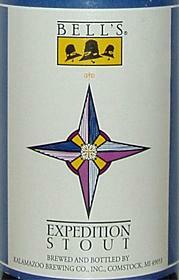 NOSE: While not as powerful as the taste, the nose reveals the deep complexity of the Expedition. Whiffs of dark chocolate, espresso beans, molasses, vanilla, and roasted malt are punctuated by the strong scent of pine resin from the hops and the unmistakable aroma of black licorice. TASTE: Bell’s does stouts remarkably well and the Expedition is probably the best dark beer amongst their “standard” offerings. There are a ton of flavors in this brew and none of them take a back seat. The chocolate flavor is rich, dark and sweet. The coffee is strong and bitter. The hops are pungent, citric, and piney. The malt flavor is powerfully roasted and robust. It’s a challenging beer but a rewarding one. Not as drinkable as the Kalamazoo, but with a lot more depth and character. MOUTHFEEL: Very full. Very unctuous. Very heavy. Just enough carbonation to keep it from drinking like syrup, but not enough to get in the way of the splendid creaminess. DRINKABILITY: Huge flavors and a thick, heavy mouthfeel limit the drinkability on the Expedition. It’s a sipping beer, to be sure. One to pour into a snifter and swirl while contemplating the mysteries of the universe. Posted in Tasting Notes.Tagged Bell's, Expedition, Russian Imperial Stout, Stout.